November 22, 2016 - "Press Releases"
VAC-U-MAX recognizes the importance of handling combustible dust safely, and has been proactive in this regard for decades. VAC-U-MAX was founded in 1954 to address the need for an intrinsically safe vacuum cleaning system for the textile industry. VAC-U-MAX founder, Frank Pendleton identified this need to collect combustible textile dust and debris safely; and the result was the development of the world’s first compressed-air powered portable vacuum unit that does not use electricity. The OSHA National Emphasis Program for Combustible Dusts, initially released in October 2007 and re-issued for emphasis and increased enforcement in March 2008, has generated many inquiries about suitability of VAC-U-MAX Industrial Vacuum Cleaning Systems for use in Class II, Division 2 environments. VAC-U-MAX compressed-air powered vacuums, Models 40008, 40012, and 40013, are the first-line offerings for Class II, Division 2 environments due to their bumper-to-bumper grounded and bonded design and their reasonable cost and availability. These vacuums meet the NFPA 77 requirements for grounding and bonding, meeting the definition of an “intrinsically-safe system”. Static-conductive polybags liners for collection of combustible dusts inside the drum. If the compressed air piping network in the facility is grounded (as it should be), then the VAC-U-MAX vacuum will be grounded automatically, eliminating operator error due to failure to connect separate ground wires. 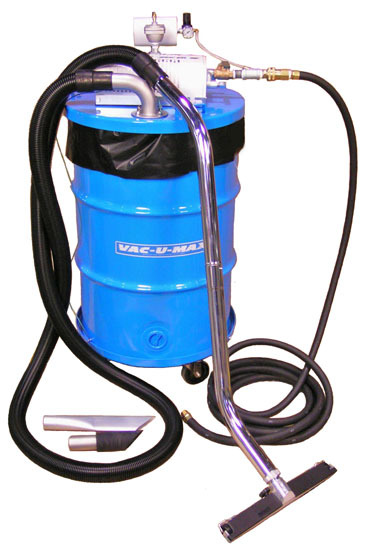 For more information about VAC-U-MAX’s full range of industrial vacuum cleaners, please visit www.vac-u-max.com/vacuum or call (800) VAC-U-MAX.